Binary Pad is a simple and convenient application primarily intended for editing files using binary notation. It allows you to directly edit the 1’s and 0’s which constitute the primary data units (bits and bytes) of a file. 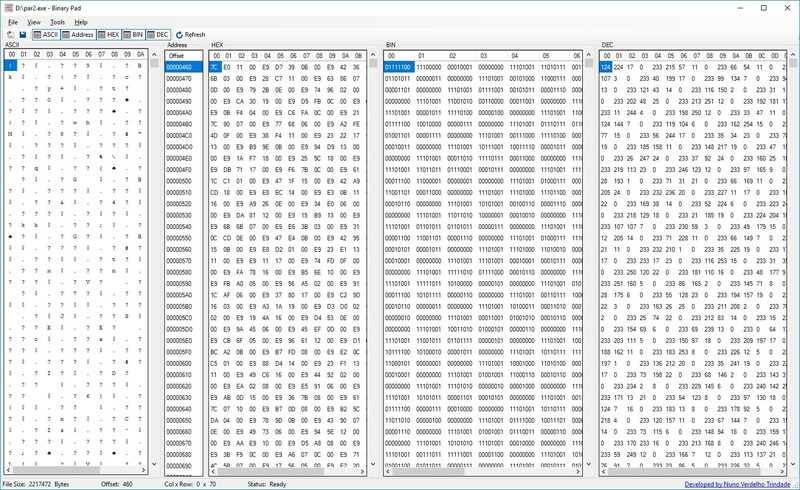 Unlike common HEX editors, the application displays the content of the file, simultaneously using ASCII, hexadecimal, binary and decimal formats. Binary Pad is compatible with Microsoft Windows 10, Microsoft Windows 8.1 and Microsoft Windows 7. Bellow you can download the 32 bit and 64 bit versions of Binary Pad for Windows.